The perfect balance between cost and quality for when you are a bit concerned about over-doing it with packaging. Sometimes you want classy packaging to impress whilst at other times your want to convey simplicity or eco friendliness. This sits in the middle of that spectrum. The magnetic closing action gives the feeling of quality and neatness yet the container is cardboard. 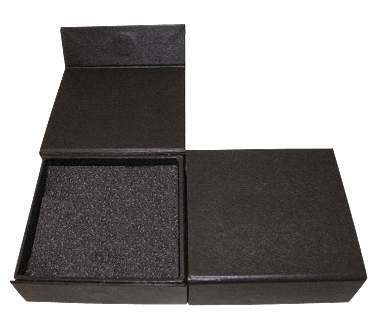 The box is big enough to take accessories like a lanyard and the foam is cut for a neat fit for whatever you add.